Please join us this Shabbat morning, September 2nd, for a special "Recovery Shabbat" service and Kiddush to reconnect with each other after the trying events of this week, to pray for those affected by the storm and to give thanks for the goodness we have in our lives. Sermon & Torah Reading at around 11 am. Service will be followed by a light Kiddush lunch. (As always, feel free to come or leave at the time that works for you). The rays of light piercing through the cloudy skies were too numerous to count. 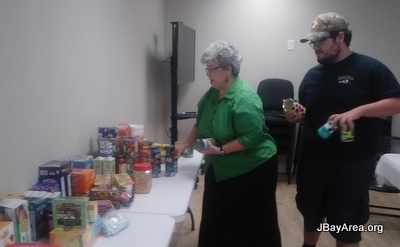 So many kind, selfless, incredible mitzvot were done (and are being done!) to assist those affected by Hurricane Harvey. 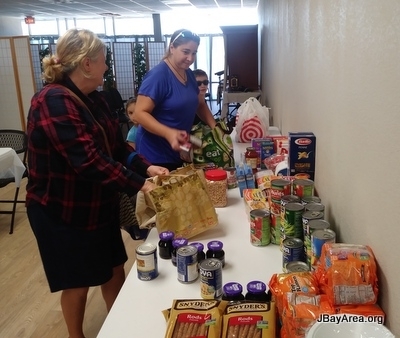 Ruthy, Ida, Lori, Addison, were among the many who stopped by at Chabad Bay Area to donate food and supplies for displaced families. Weather conditions permitting, we will be holding services tomorrow morning. 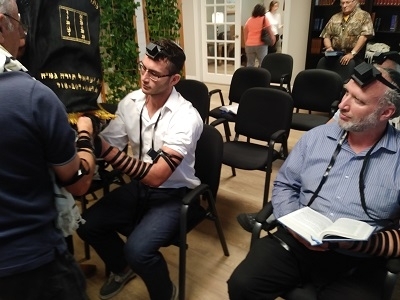 Dedication of First Torah Scroll! 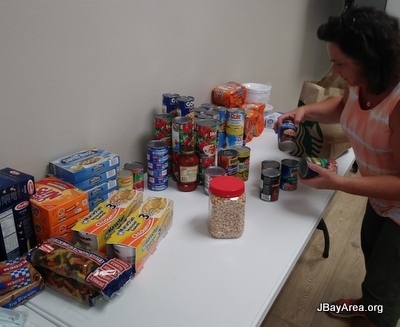 You are invited to participate in the Bay Area Jewish Calendar. Excellent way to honor a birthday, anniversary orYahrtzeit. Only $25! 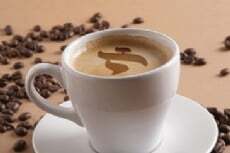 Promote your business (a business expense) and support a good cause. It is mailed free to Jewish homes and businesses (in Clear Lake, League City, Pearland, Friendswood, Galveston) It includes holiday and Shabbat info with candle lighting times and lots of helpful info for Jewish life! Only one week left before we go to print. 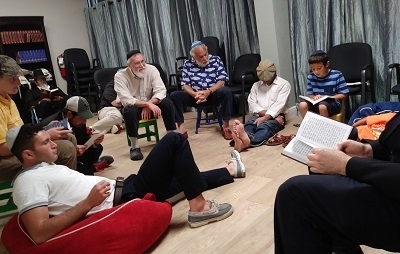 The five week "Read it in Hebrew" crash course, led by Malky Schmukler, got off to a great start this week! With four more lessons to go, it is not too late to join in! Click here for more info and to register. 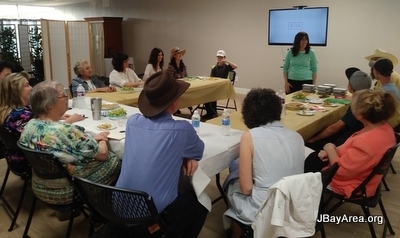 Service followed by Kiddush lunch with hot cholent! 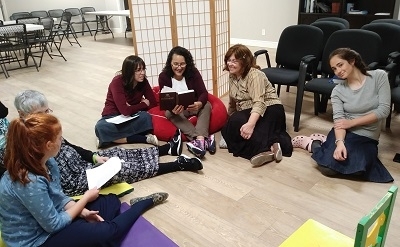 Hebrew Reading Course - This Tuesday! 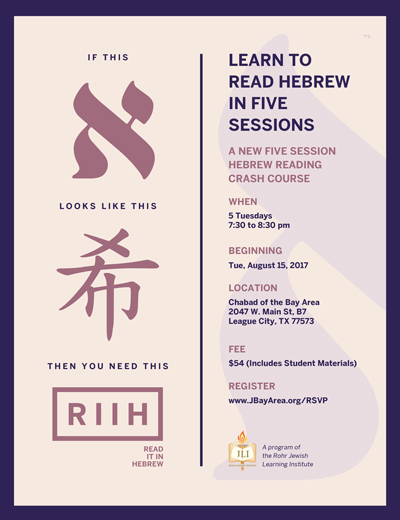 Don't miss out on this very special opportunity to learn how to read Hebrew! The course starts this Tuesday. If you haven't yet reserved, please register ASAP. Advance registration is highly suggested, as student supplies are ordered accordingly. Thank you! 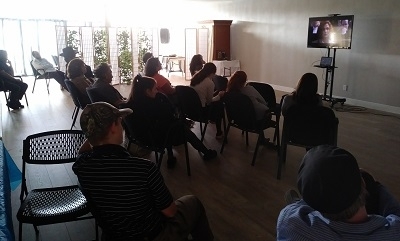 Tisha B'Av at Chabad Bay Area: Traditional Reading of Eicha (Book of Lamentations) on the Eve of the Fast, afternoon viewing of the film Denial, and a Minyan for the services at the end of the fast. Sponsoring a Kiddush is a wonderful way to celebrate a special occasion (such as a birthday or anniversary) or remember a Yahrtzeit. 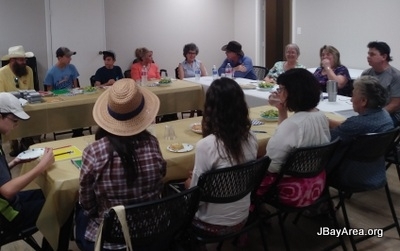 For a regular Shabbat the suggested amount is $180 for kiddush lunch or $360 for a larger crowd and a more elaborate lunch. 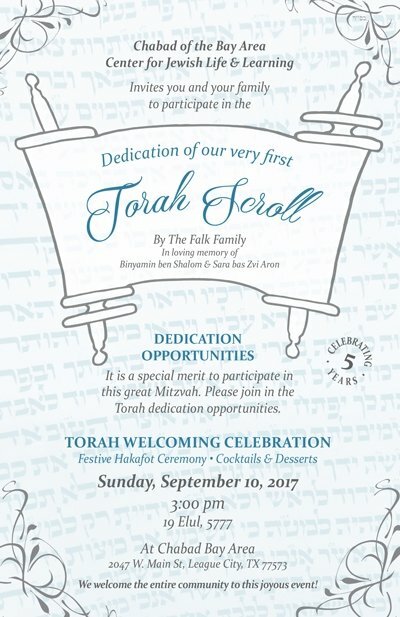 Please contact the rabbi or Malky to reserve, or to find out about other options or organizing another type of celebration or event.